Lots of people love messing with brands on social media. Everyone else enjoys seeing a brand break from their usual stodgy demeanor to strike people down like Darth Vader facing Obi-Wan Kenobi. Wendy's (and Moonpie, for some reason) is pretty good at this game, burning other chains and customers alike. 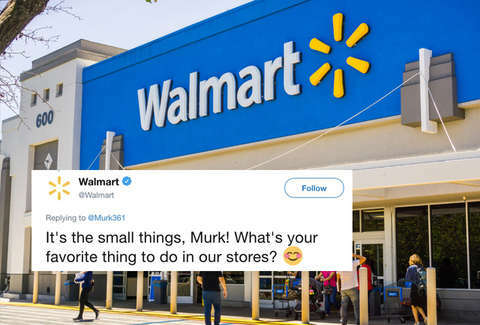 Walmart just joined the merry band of companies showing personality on Twitter by roasting a customer with Wendy's-level snark. It all started innocently enough with a tweet from @Murk361. He said he likes going to Walmart for fun. Though, in retrospect, he might have been attempting to set himself up for a joke if the big box store were to reply. Walmart did respond, asking what he's doing at Walmart that gives him so much pleasure. However, Walmart got the final word. It maybe didn't reach the levels intense clapback Wendy's can dish out, but people were loving it in the replies. Either someone went rogue or the Wendy's game is catching on.